SUMMARY: We performed a detailed neuroimaging study in a patient with Parry-Romberg syndrome. Proton MR spectroscopy demonstrated normal spectral patterns, though conventional MR imaging revealed high-intensity areas in the entire white matter in the left hemisphere. Single-photon emission tomography showed increased perfusion in the cortex of the affected hemisphere. Pyramidal tracts and optic radiations were preserved on diffusion tensor tractography. We will correlate these neuroimaging findings with normal psychomotor development in our patient. Parry-Romberg syndrome is characterized by a progressive and self-limited hemifacial atrophy of the skin and subcutaneous tissue and sometimes underlying bony structures of the face and cranium. Common neuroimaging findings of this syndrome are calcification on CT and high-intensity areas on MR imaging.1–9 We report a patient with Parry-Romberg syndrome who had achieved normal psychomotor development despite extensive white matter lesions. We performed precise neuroradiologic studies including single-photon emission CT (SPECT), proton MR spectroscopy (1H-MR spectroscopy), and diffusion tensor imaging (DTI). A 22-month-old boy was referred to our hospital because of facial hemiatrophy and MR imaging abnormalities. He was the first child of healthy nonconsanguineous parents. At 4 months of age, the parents noticed asymmetry of the patient’s face. The skin around the left eyelid and maxillary region was atrophic. Facial hemiatrophy progressed during the following 12 months. He was diagnosed with Parry-Romberg syndrome at 18 months of age. However, his developmental milestones remained normal. 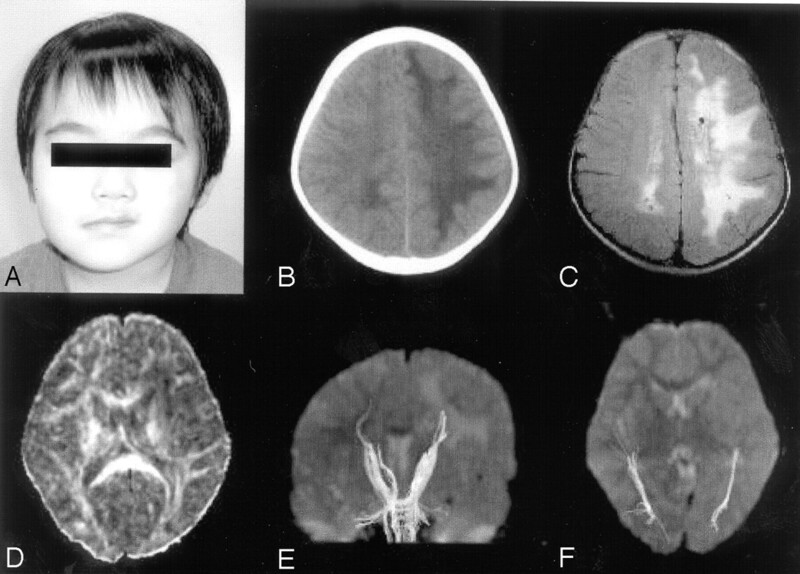 The patient presented at 22 months of age because of widespread white matter lesions in the left hemisphere that showed decreased signal intensities on T1-weighted images and increased signal intensities on T2-weighted and fluid-attenuated inversion recovery (FLAIR) images. A similar white matter lesion was also seen in the occipital areas in the right hemisphere. Findings of a neurologic examination and his psychomotor development were normal at the presentation, though left facial hemiatrophy was observed (Fig 1A). 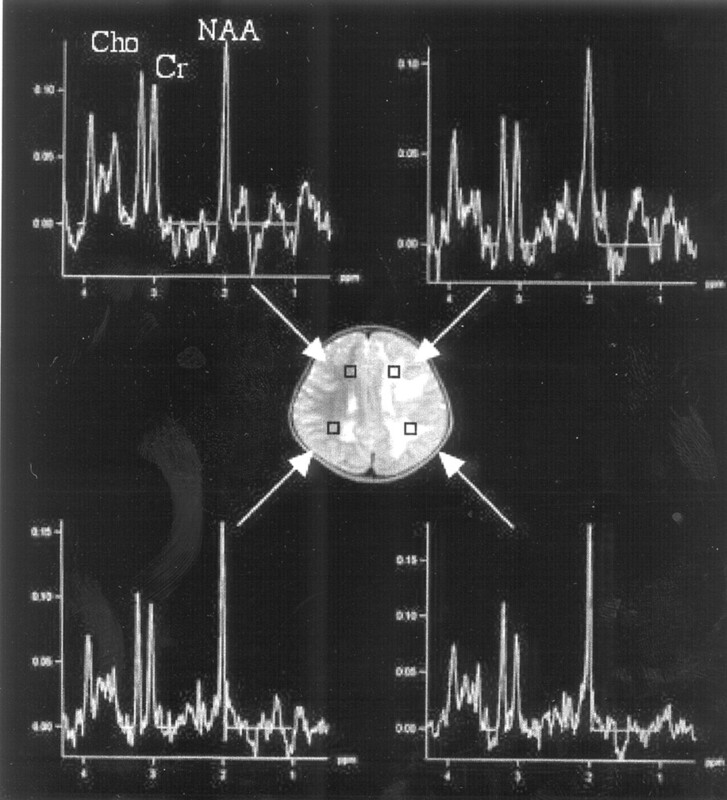 Findings of electroencephalograms and brain stem auditory-evoked potentials were also normal. CT at 34 months of age showed marked low attenuation in the entire white matter in the left hemisphere (Fig 1B). Calcification was not detected. Photograph, CT, and MR imaging of the patient. A, Photograph at 34 months of age. Skin and soft-tissue atrophy of the left periorbital and premaxillary areas are recognized. B, CT scan obtained at 34 months of age. Low attenuation is shown in the entire white matter in the left hemisphere. C, FLAIR image obtained at 44 months of age. Abnormal high-intensity areas are observed in the entire white matter in the left hemisphere and in the occipital region in the right hemisphere. Small cysts are seen in the bilateral deep white matter. D, FA map. Decrease of anisotropy is observed in the white matter in the left hemisphere. E, Tractography of pyramidal tracts. Pyramidal tracts are clearly depicted in both hemispheres. F, Tractography of optic radiations, which are also depicted symmetrically. Serial MR imaging was performed at 33, 44, and 60 months of age. 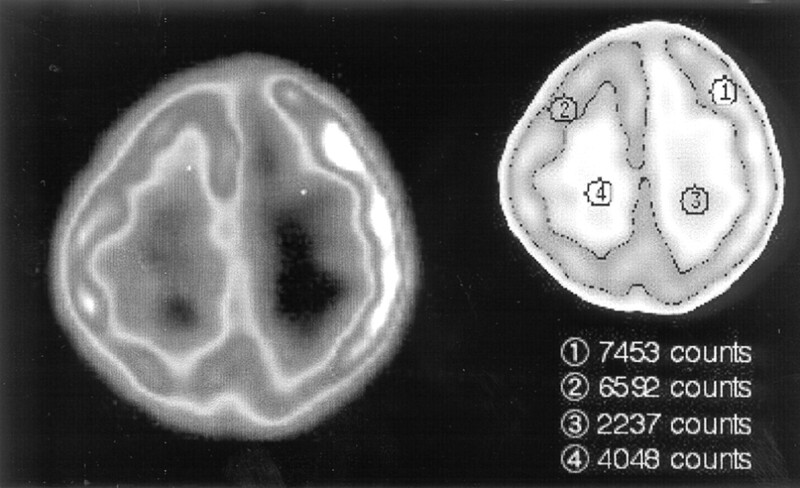 All images demonstrated marked T1 and T2 prolongation in the entire white matter in the left hemisphere and in the occipital region in the right hemisphere (Fig 1C). The extent of the white matter lesions had not changed until 60 months of age. Ventriculomegaly or cortical abnormalities had not been observed until the last study, though small cysts in the bilateral deep white matter were newly recognized on the second and the third scans. MR angiography performed at 33 and 44 months of age did not show any vascular abnormalities. SPECT was performed with technetium Tc99m hexamethylpropyleneamine oxime by using GCA-9300A (Toshiba, Tokyo, Japan) at 31 months of age. On visual inspection, blood perfusion was decreased in the entire white matter in the left hemisphere. In contrast, it was relatively increased in the cerebral cortex in the affected hemisphere. Quantitative regions of interest analysis also showed that blood flow within the white matter in the left hemisphere was 55% of the corresponding region of the right hemisphere, whereas that within the cortex in the left frontal lobe was 113% of the contralateral hemisphere (Fig 2). SPECT findings. Blood perfusion is decreased in the white matter in the left hemisphere, whereas it is increased in the cerebral cortex in the ipsilateral hemisphere. 1H-MR spectroscopy was performed on a 3T MR imaging scanner (Trio, Siemens, Erlangen, Germany) at 60 months of age. 2D chemical shift imaging with a point-resolved 1H spectroscopy sequence was used, covering bilateral deep white matter with scan parameters as follows: TR/TE, 1700/30 ms; 3 number of averaging; voxel size, 10 × 10 × 15 mm; matrix, 8 × 8. 1H-MR spectroscopy showed normal spectral patterns in the white matter in the frontal and parietal regions in the left hemisphere as well as in the corresponding regions in the right hemisphere (Fig 3). Proton MR spectroscopy. Normal spectral patterns are observed in both hemispheres. DTI was performed on a 3T MR imaging scanner by using a Stejskal-Tanner sequence with single-shot spin-echo type echo-planar imaging (TR/TE, 7000/75 ms; matrix size, 128 × 128; field of view, 256 mm; 60 axial sections; 2-mm section thickness). We collected diffusion-weighted images along 6 different directions with a b value of 700 seconds/mm2, as well as an image without diffusion weighting (b = 0 seconds/mm2). The brain fiber tracking was performed by using the free software dTV (version 1.5, http://www.utradiology.umin.jp/people/masutani/dTV.htm) for DTI analysis developed by the Image Computing and Analysis Laboratory, Department of Radiology, the University of Tokyo Hospital, Japan. A fractional anisotropy (FA) map showed remarkable decrease of anisotropy in the white matter in the left hemisphere (Fig 1D). However, tractography demonstrated excellent resolution of white matter tracts in both hemispheres. Pyramidal tracts and optic radiations were clearly depicted without apparent asymmetry (Fig 1E, -F). At the last follow-up at 65 months of age, our patient’s psychomotor development was still normal. Findings of neurologic examinations were also normal. Neurologic symptoms such as migraine, seizure, or facial pain had never been observed. The outstanding feature of our patient is normal psychomotor development, though conventional MR imaging showed extensive white matter lesions. The conventional MR imaging findings in our patient are consistent with several previous reports.2–7 However, SPECT, 1H-MR spectroscopy, and DTI provided some new findings in our patient, which correlated with normal psychomotor development. SPECT showed relatively increased regional blood flow in the cortex of the affected hemisphere, whereas it was remarkably reduced in the white matter of the same hemisphere. On the other hand, DeFelipe et al6 reported that SPECT showed an extensive hypoperfusion in the parietooccipital area in the affected hemisphere in a patient with this syndrome and temporal lobe epilepsy. We believe that the difference between these patients is explained by the presence or absence of significant cortical dysfunction. Relatively increased blood flow in our patient is related to the preserved cortical function, despite widespread white matter abnormalities. As a result, he can achieve normal psychomotor development and remain free of neurologic symptoms. 1H-MR spectroscopy findings were noteworthy in our patient, revealing no abnormalities in the affected white matter. Several changes in levels of metabolites, such as N-acetylaspartate, choline, and lactate, are usually observed in various degenerative, ischemic, or inflammatory brain disorders, but normal 1H-MR spectroscopy findings suggest that neuronal or axonal damage is rather mild, if present, despite extensive changes on conventional MR imaging. This is also related to the preserved brain function in our patient. DTI findings were also remarkable in our patient. DTI is an imaging method that reflects the molecular movement of water. Diffusion of water molecules is restricted by cell membranes in cerebral tissue. Water molecules can diffuse relatively freely parallel but, only to a limited extent, perpendicular to tracts. The multiple myelin laminae are closely related to restriction of water molecules in the white matter. In our patient, widespread decrease of FA was recognized in the white matter corresponding to the abnormal high-intensity areas on conventional MR imaging. This finding suggests that MR imaging abnormalities may be attributable to impaired myelination. On the other hand, pyramidal tracts and optic radiations were symmetrically depicted on tractography. This suggests that white matter pathways are likely to be preserved in our patient. Axonal injuries may be mild, if present, though widespread white matter abnormalities were observed on both conventional MR imaging and DTI. In summary, SPECT, 1H-MR spectroscopy, and DTI suggested the preserved cortical function and white matter pathways in our patient, though conventional MR imaging revealed extensive white matter abnormalities. These advanced neuroimaging techniques are useful in understanding the functional aspects of the brain in patients with conventional MR imaging abnormalities. Accepted after revision September 23, 2005.